The Ambrosia Villa is a luxury three bedroom three bathroom villa in Coral Bay Village within walking distance of a wide selection of restaurants, tavernas, cafés, bars, and the Municipal sandy beach of Coral Bay. The villa boasts a large private outdoor area including a 5m X 10m pool with walk-in steps, a private shaded outdoor dining area, outdoor lounge, and a full collection of outdoor furniture including sunbeds and umbrellas. Inside, the villa has a modern fully fitted kitchen and dining area, lounge, and three bedrooms and three bathrooms. The master bedroom has a balcony which benefits from exceptional sea views. * 3 Bedrooms & 3 bathrooms. * Air conditioning throughout the villa included in the rental rates. * UK & SKY TV. * Convenient location within a few minutes’ walk of the beach and the center of Coral Bay. * Shaded outdoor dining area overlooking the pool. * Full collection of ourdoor furniture. Villa is ideal for holidays as it offers 3 bedroom and 3 bathrooms and is very well equipped for family holidays. Ideal location in a pleasant area with no noise but sufficiently near both the sandy beach of Coral Bay and the main strip where all the restaurants and cafes are located. Car not necessary as everything is within a short walk away. Three bathrooms of which two are en-suite with one extra shower room and wc on the ground floor. Secure private parking on the villa grounds. Bathroom towels are provided but please bring your own beach/pool towels. Spacious modern open plan living and dining area which offers access to the outdoor shaded dining area overlooking the pool. Lounge offers TV, CD player, and DVD player and there is seating for up to 6 persons in comfort. A generous welcome pack is offered to our guests with our compliments. Open plan dining area adjoining the lounge and kitchen with direct access to the shaded outdoor living area as well as the private pool area. IPTV with UK and SKY channels. Tennis is available at all the hotels in the Coral Bay and most are within a short walk of the villa. There are four golf courses within a 30 min drive of the villa. Completely private 5m X 10m pool with walk in steps. Notes on accommodation: The villa is spacious and has been furnished to a high standard. It includes all those items one would expect of a luxury villa and a full collection of outdoor furniture. The accommodation has been specifically designed to cater for guests who enjoy holidays in a private villa and who wish to be located within an area which offers a wide selection of restaurants, tavernas, beach and all amenities. Car hire is optional and not necessary for this villa. Outside: Large and shaded private outdoor dining area which overlooks the pool, 5m X 10m private pool with walk-in steps exclusive to the guests of this villa, full collection of outdoor sunbeds and umbrellas. Large mature and well maintained private gardens. Cleaning / Towels / Linen / Maid service: Towels and linen are provided for but please bring your own beach towels. Mid-stay clean is provided for. 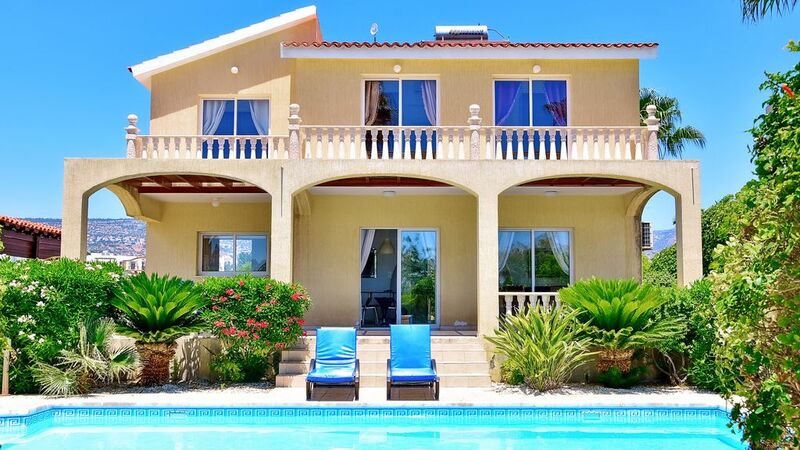 Lovely villa overlooking the sea in Coral Bay. Well maintained and Paul from the management company responded immediately when we needed help with the TV. Property is spacious and well equipped and the 'welcome pack' was a nice touch. If we come back to Cyprus we'll definitely consider coming back to Villa Ambrosia! Have had an absolutely wonderful time at this villa. Very helpful management. The welcome pack was a lovely touch meaning we didn’t have to rush out to the shops. I admit the villa does need a little tic but this has been impossible when the villa has been fully booked. The work is being done after we leave as it’s the first time it’s been available to do the work. The shower cubicles are lovely and having 3 bathrooms was a dream! The views from the bedroom balconies are breathtaking and we had some fantastic photo opportunities from spectacular sunsets and sunrises to clear night skies with stars you could almost touch. We didn’t get to use the pool as weather wasn’t on our side this week but we still enjoyed the layout and the beautiful landscaped garden. The living space is more than adequate and kitchen is fully equipped. Would I stay here again...110% I would. Thank you Chris for a wonderful holiday! Great villa in a lovely location with nearby facilities and transport links. Only minor points are the villa is looking a little tried and had a few niggly problems such as cracked plaster, leaking showers etc however been informed that these are being addressed in the near future. These issues however did not spoil our overall experience of the villa and any queries that we had were quickly responded to. Chris arranged our collection from the airport and the driver was great, very friendly and informative of the area. The villa was lovely, great setting, 2 min walk to Corallia beach and a great bar serving food and drink until 5.30.the bus stop is also 2 min away and takes you to the main strip (lots of restaurants to choose from)for €1.50 and also into paphos for the same money. Local supermarket 5 min walk away which is very convenient and Phillipos the larger supermarket would need a taxi to take u there but they the supermarket do bring you and your food home if you spend min €50. We did not have a car and and it really wasn't necessary. The villa was lovely, spacious and bright with a lovely large pool and relaxing veranda. As previously mentioned the showers do not have screens (they have shower curtains) and this can be a pain but I understand screens are being installed soon. The aircon unfortunately is on a 2hr timer which can be frustrating during the night and unfortunately this is quite common in rentals. Although the English tv was not important to us, the children did want to watch it occasionally but it wasnt great as it kept cutting out due to the internet speed but again I understand this is being looked into. On contacting Chris (or Paul at the management company) I have to say they got back to us immediately.Very efficient. We enjoyed horse riding at George's stables (cab ride away €10) and used traffic rentals, which is again 2 min walk away to book our quad biking adventure, this was absolutely amazing, we saw the sea caves, turtle bay etc, a definate must, highly recommend. We will definately book again. The popular municipal sandy beach of Coral Bay Village is about 5 minutes walk away. Paphos International Airport is 20km away, and Larnaca International Airport is about 1.40 hour away. The villa is located in the heart of Coral Bay and is within a short walk of banks, restaurants, tavernas, cafés, bars, and shops as well as the sandy beach of Coral Bay. Paphos International Airport is 20km away, and the nearest large town is Paphos which is located less than 10 minutes by car and has a large selection of shops, restaurants and a good night-life. Why Choose This villa ? This villa will appeal to guests who enjoy exceptional levels of comfort and who would like to located within a short walk of restaurants, bars, cafés, shops and supermarkets. The villa is also within a short walk of the sandy beach of Coral Bay. Booking Notes: If you would like to provisionally reserve the villa pending your search for suitable flights we would be happy to take the villa off the market for you for a period of 3 days in order to offer some ‘breathing space’. Once you have found suitable flights, to secure the booking we ask for a down payment of 25% and the balance 8 weeks prior to arrival. Payment can be made to us via either a cheque drawn on a UK bank, by direct bank transfer, or through any of the major credit/debit cards. Our changeover day is flexible and our minimum stay is for 5 nights. Check in time is from 15:00 hours and our check out time is until 11:00 am. Notes on prices: Please note that the rental rates are inclusive of the use of air conditioning and there are no additional charges to the villa hire of any nature. Access to the Villa & Airport Transfers Please note the following information for your airport transfers and car hire. Car Hire For car hire, we recommend an excellent local company which will offer you preferential car hire quotes as our villa guests. They will meet you at the airport and deliver the car to you there, you will then follow their representative to the villa where he will give you the keys to the property and will do the paperwork for the car hire at the villa with you. Please feel free to contact houlos@hotmail.com or view their website: https://www.carrentalcyprus.co.uk Airport Transfer If you would like for us to arrange a taxi for you then we will arrange for a trustworthy incensed taxi driver to meet you at the airport and drive you to the villa. Our trusted taxi driver offers the following airport transfer rates: PAPHOS AIRPORT TO VILLA IN CORAL BAY: 1-4 Persons € 45.00. 5 Persons € 55.00. 6 Persons € 60.00. 6+ Persons additional € 10.00 per person.